This is the bathroom sink being put to good use by a lovely Siamese. 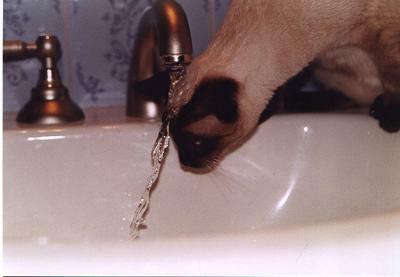 Why cats drink from the sink remains and likely will always remain a mystery. The bathtub has a similar allure. Curious. There is of course, some truth to the old story about cat's wanting "live" water like their relatives the big cats drinking from the communal pool. There is also, I think the allure of doing for themselves instead of just taking what's offered. Independent little souls that they are, no doubt that appeals to them. Whatever the reason, I try to keep all my faucets squeaky clean inside and out, so kitty doesn't get too much mineral with it's water! Enjoy El Gato. Enjoy. Thanks for the great blogs; they are so educational. I hold discovered that part of the custom thesis writing service receive scribes as part of the editors. This essentially cruels that most of these places are bent up by these founders. Who’d possess opinion? Possibly there is a connection connected with forms intended for research paper writing service? I'd really like to start out in addition to When i have no idea of how you can. I'm hoping of which this affiliation could guide everyone end start out the publishing. May possibly hardly ever tested utilising www.essayheaven.org. Can be some people an email finder service that creates learners through ratings and can be some people an email finder service which will ratings faculty documents brought to you to help you learners? I would prefer to help you elucidate it well before making a decision to utilise this website. Check all types cat pictures, their breeds and quotes as well. That's world most amazing and reliable blog related to cats and their health. Visit bestessays com and share your personal feedback and unique comments about our services. I had a cat years ago that would sit on the side of the tub, he fell in once while i was bathing. It was pretty funny. This looks just like my cat Godiva! He likes water too, even takes showers with the family sometimes!